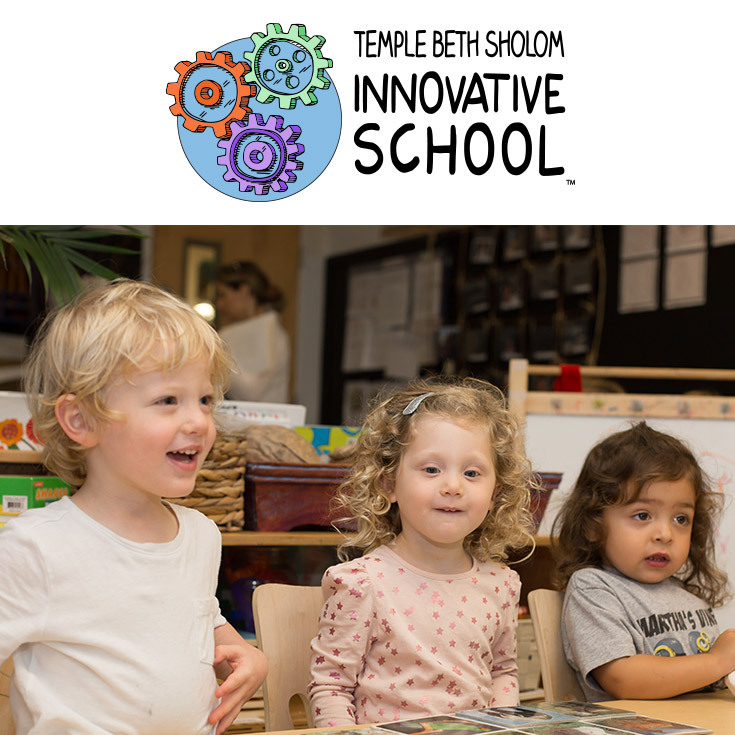 The Infant/Toddler Learning Center at Temple Beth Sholom Innovative School welcomes children as young as 8 weeks. These children stay with this program until they are ready for our preschool program, usually around 2 years old. We are a full-time, full-day program. We are open from 7:30 am to 6:00 pm, Monday through Friday except for major Jewish and federal holidays. We are a family environment where the infants and toddlers learn with and from one another. We have discovered that our children learn best from each other and we, their teachers, are there to support this development. The Infant/Toddler Learning has a playroom with a see-through divider that creates age-appropriate areas for both infants and toddlers to interact safely and developmentally. All of our children come together for circle time, reading, and music. As the children grow, the older children, with the help of a caregiver, begin to “help” look after the younger children. They practice sharing and nurturing skills, provide comfort, and “read” books to them! In the play room, all of the children are exposed to creative and expressive experiences. Children as young as four months are given paints while on tummy time, giving them the chance to get messy and truly feel the paint and see, up close, what they create. As they grow and develop their strength and skills, the experiences change. They will go from painting while on tummy time to having access to different creative materials like brushes, sponges, and paint wells. This allows the children to experience a familiar material in a new way. Children are offered cooking experiences once a week. Whether they make applesauce or challah dough, children participate as much as they want to or can. During kitchen time, children are encouraged to join in every aspect of the process: with safe cooking utensils, our little “chefs” cut apples, mix ingredients, knead dough, and use a mixer. Our napping space is aesthetically designed for cozy comfort. Each child has their own crib or cot. We keep the room as quiet and dark as possible while still being mindful that the children need to be able to differentiate between day-time and night-time sleeping. If children are not ready to sleep, we support them and help them to relax and rest so their bodies and spirits can recharge. The hallway connecting both areas is specifically set as a sensory and creative expression area. Along the wall is an easel where children can paint, draw, and color. When the easel is not in use, we offer sensory bins designed for children to be exposed to wet, dry, and textured materials. The children spend part of their day on our front playground. This area is specially designed for young children to safely run, jump, climb, and slide. We bring out additional materials to encourage structure building, ball play, and imaginative play. We have a large shaded area and cold drinking water. Weather permitting, children over one year in age spend 30 minutes in the morning and most of the afternoon playing and exploring outside. Children under one year of age are brought outside for shorter time periods. Depending upon their development, these children will use the swing, our moveable climbing structure, or sit in chairs so that they can experience the sun and wind on their faces. In good weather, we often have snack time on our community picnic table. Children also experience water play on the playground, where they get to splash, jump, dump, and enjoy getting wet!